NY Bagel Café and Deli has been an up and coming brand for a while now, and despite renewed competition from brands like Dunkin’ Donuts, Denny’s, Quick Chek, and 7-Eleven, continues to grow at an impressively steady rate. According to several online franchisee review sites, New York Bagel Café and Deli was marked as one of the best food franchises to start up, along with other popular names like Rita’s, Saladworks, Little Caesar’s, Mrs. Fields, and the Smoothie Factory. What is the secret to its success? Most have chalked it up to the chain’s original NY flavor; despite holding locations vast and far across the nation, NY Bagel Café and Deli has proven time and time again to offer the unique New York taste and a wide variety of options that keep its customers satisfied. NY Bagel’s extensive menu offers a variety of options for its myriad of customers at prices that are affordable and made with brands like Boar’s Head that customers love and trust. Besides being inexpensive and humanitarian, NY Bagel Café and Deli is an eatery that customers tend to fall in love with. With has a personality of its own, from the comfy seating and pleasing smells to the cheery staff and delightful backdrops, it’s no wonder NY Bagel is on the rise. Keeping up with the trends, NY Bagel offers unique tastes (like its Pumpkin Spice cream cheese), as well as various “seasonal” flavors (like eggnog, cinnamon, and nutmeg for winter and Irish Cream and green bagels for St. Patrick’s Day). All you need to know that NY Bagel Café and Deli is hot and trending is to take a quick glance at any food rating site and see what the satisfied customers have to say. Users on platforms like Yelp and Seamless have awarded us an average of four stars and have given us hundreds of reasons why NY Bagel is their favorite local eatery, citing our varied menu, speedy delivery, and warm staff; some, like Denise D. of Franklin Township (New Jersey) have even gone so far as to call NY Bagel their staple. NY Bagel Café & Deli is the brainchild of Joe Smith, an enterprising upstate New Yorker who saw the opportunities back in 1994 for making inroads in the franchise fast-food market. Take a proven commodity – everyone’s favorite “light” meal, the bagel – and then take it one step further. Offer the original New York bagel, and create a cornerstone for a bagel franchise … without the typical franchise bagel taste. Then structure the business for ease of investment and operation, and “spread the wealth” with other motivated self-starters. You’ll find that NY Bagel Café & Deli runs rings around other bagel shops with a delicious array of complementary foods. Like popular Boar’s Head deli meats and cheeses, the smoothest flavored cream cheeses, succulent smoked salmon and richly brewed gourmet coffees. How about Panini sandwiches, popular wrap sandwiches, freshly prepared salads and fresh baked goods? We feature REAL NY Water Bagels and Bialys baked fresh every day. Franchises opportunities are available nationwide with single and multi-units available. The concept is primed for development anywhere people love a great bagel. How about your hometown? 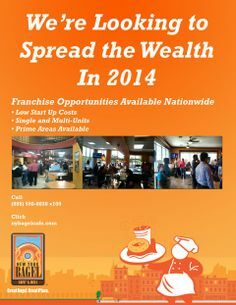 For more information on owning a NY Bagel Cafe & Deli franchise, visit nybagelcafefranchise.com or nybagelcafe.com/franchising.